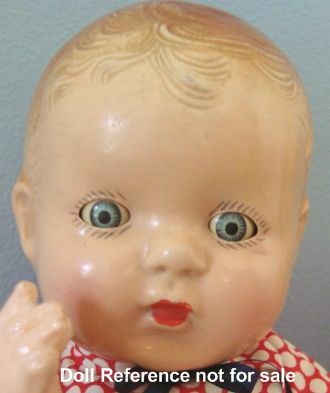 Atlas Doll Company was founded in Chicago, Illinois, they Registered in U.S. the trademark Toddles, which was molded into dolls." from Coleman's book; Collector Encyclopedia of Dolls, Volume I, on page 25, just that one sentence entry is all we could find on this company. 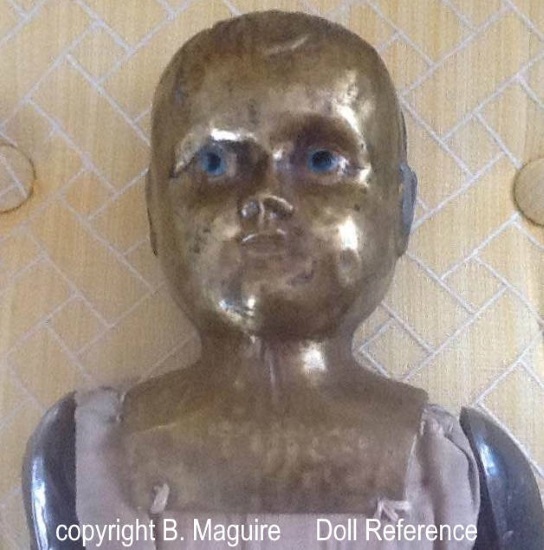 The Toddles doll shown at left, is marked on the back of his neck in script Toddles, he is 11" tall, composition head with lightly painted molded hair, tin blue sleep eyes, painted upper and lower eyelashes, a closed painted mouth, slightly rosy cheeks on a composition five piece bent limb baby body. Atlas also produced the Dolly Jump Rope doll in 1928, 13" tall, composition shoulder head with molded painted blonde hair, blue painted eyes, open/closed mouth with four white painted teeth, metal arms attached to the jump metal rope, cloth body and legs, jointed at the shoulders and hips, came in her own wheeled metal cart with attached push handle, when arms are turned appears as though the doll is jumping the rope. Doll marked Century Doll Co (on the back of the shoulder plate).